In this article, we will cover how Steve can setup WooCommerce Table Rate Shipping Pro plugin to calculate shipping based on products quantity. So read along to know more about it. WooCommerce store owners have had a preference for customized shipping rates over the real-time shipping rates from various carriers. Especially when dealing with multiple types of products, store owners seem to get confused by the shipping rates provided by the shipping carriers. Now Steve can easily create shipping rules based on the shipping classes. For this, he needs to select the following Matrix Columns from the Settings tab in plugin settings. Once he selects these columns, he can set the calculation mode to Per Shipping Class. After setting up these, he can easily configure shipping rules based on his requirements. 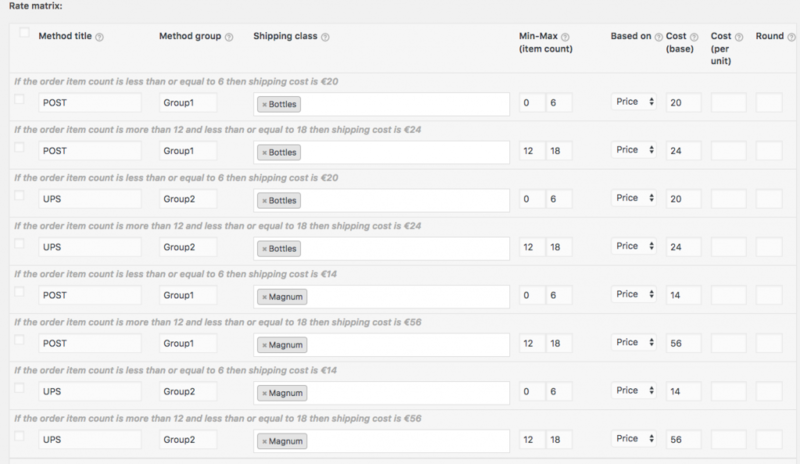 The image below shows Steve’s shipping rules configured using WooCommerce Table Rate Shipping Pro plugin. So this article covers WooCommerce Table Rate Shipping plugin. Using this plugin WooCommerce store owners can easily calculate shipping rates in case of Netherlands using the ZIP Code/Shipping Zone based shipping calculation. In this article, we will cover the WooCommerce Table Rate Shipping Pro’s ability to calculate weight based and shipping destination based shipping rates.